I love soup! It’s delicious, you can load it with veggies, and it’s quick and easy to prepare. We’ve got some big-time meat eaters in our family, so I especially like making soup with meatballs in it to make a really meaty soup. Tonight is the first time I’ve made this soup, but it was really tasty. In a medium-sized bowl, combine the Italian sausage, ground beef, one tablespoon of the garlic, the Italian seasoning, 1 teaspoon of the salt, and 1/4 teaspoon of the black pepper, mixing until well combined. Form into one-inch meatballs. Set aside. In a large pot, heat the duck fat over medium-high heat until it shimmers. Add the onion and cook, stirring occasionally, until the onion begins to brown, about five minutes. Add the stock, the remaining one teaspoon of salt and 1/4 teaspoon of pepper, tomatoes, fennel, red pepper, mushrooms, zucchini, and carrots. Stirring occasionally, bring the mixture to a boil. Drop in the meatballs. 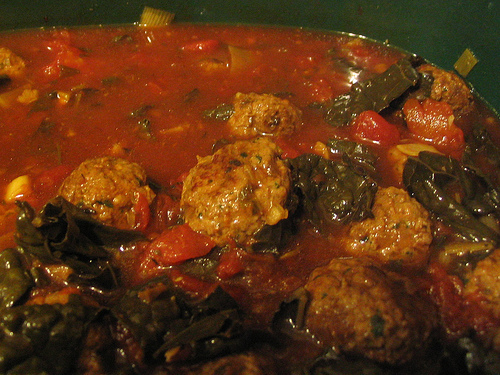 Return the soup to a boil and cook until the meatballs are cooked through, 20 to 30 minutes (depending on size). Stir in the baby spinach and basil. Remove the soup from the heat. They had beautiful cucumbers at the farmers market this week, so I picked up a few. 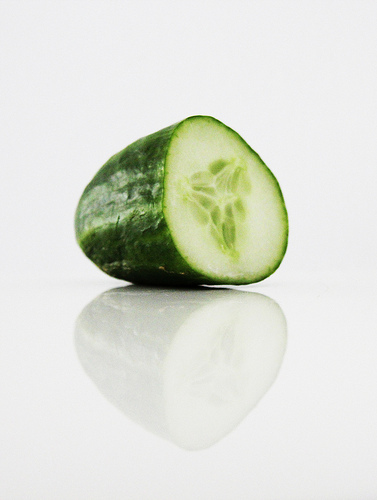 I find cucumbers really refreshing – particularly in the summer. I love their slight acidity, which adds balance to fatty or rich cuts of meat, such as pork belly. I also picked up some cilantro, red scallions, and red heirloom carrots. I have a spiralizer that I love to use to turn veggies into noodles, so I knew immediately what I wanted to do with this combination of farmer’s market veggies. I wanted to spiralize them into cold, crunchy “noodles” and then toss them with an Asian-inspired vinaigrette. If you don’t have a spiralizer, you can use a vegetable peeler and cut the cucumbers and carrots into long, wide strips. You can use a paring knife to cut the strips into “noodles” or you can leave them as wide strips. It’s up to you. In a large bowl, combine the cucumbers, carrots, scallions, and cilantro. In a small bowl, whisk together the olive oil, vinegar, orange juice, orange zest, sea salt, pepper, ginger, garlic, sriracha, and sesame oil. Toss the vinaigrette with the vegetables and serve cold. For more spiralizer recipes, check out the Healthy Spiralizer Cookbook, which I wrote for Rockridge Press. It contains an array of veggie based “noodle” recipes using a spiralizer. I really like my Paderno World Cuisine Spiralizer, which works like a pro with many vegetables. If you’re trying to cut down on carbs, or if you just want to find a great way of adding noodles to your diet without the gluten, a spiralizer is a wonderful choice. I like making zucchini noodles into pasta, that I can then toss with all types of Italian sauces. You can also make soups, salads, and an array of other tasty vegetable and fruit dishes.